The plastic edges on the back are a little bent and don't make a full anymore (pictures #5 and #7). The card is a little bowed and curled (picture #6). 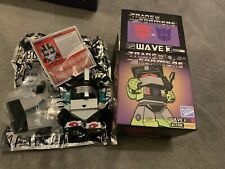 Transformers The Loyal Subjects TLS WHEELJACK 3.5in. 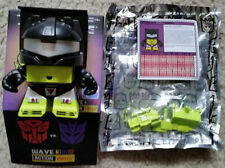 Action Vinyl 2/16 Wave 3. Condition is New. Shipped with USPS First Class Package. Manufactured by "The Loyal Subjects". This is the "Red" colors version. packaging may have some shelf wear on it. Wave Three is BIGGER and BADDER than ever! Sizes ranging from 3.25"-3.5" tall! Includes 9 points of articulation, locked ball joints, Chest and back pieces, interchangeable accessories, SOUND and LEDs! This has a blind box ratio of 2/12. Which one will you get?. It's a surprise! Constructicons, Dinobots, Tapes.Oh My! Wave Three is BIGGER and BADDER than ever! Sizes ranging from 3.25"-3.5" tall! Includes 9 points of articulation, locked ball joints, Chest and back pieces, interchangeable accessories, SOUND and LEDs! 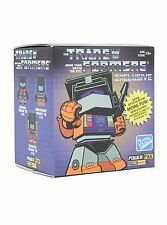 One (1):SCRAPPER"Orange Edition".Electronic Version w/ Sounds ! Exclusive Glow in Dark Edition. Probably not, but we don't know. Important Order Information. We don't want to take anyone by surprise. 15 39" 33" 42". 13 38" 32" 41". 11 37" 30" 40". 9 36" 29" 39". Probably not, but we don't know. Add To Favorites. Conversion Chart. Important Order Information. We don't want to take anyone by surprise. Will we be receiving more of a particular style of clothing?. Now bigger, badder and better. Including his retractable Dino head, Energon Sword and Double Barrel Energon Blaster. This dude is bad! Even has the little T-Rex arms and transformable bits of the T-Rex tail on his ankles.